In 12-inch skillet, heat oil over medium heat. Add onions; cook 1 to 2 minutes, stirring frequently, until tender. Stir in rice, tomatoes, broth and pepper. Heat to boiling over high heat. Reduce heat to low; cover and simmer 15 minutes, stirring occasionally, until most of liquid is absorbed. 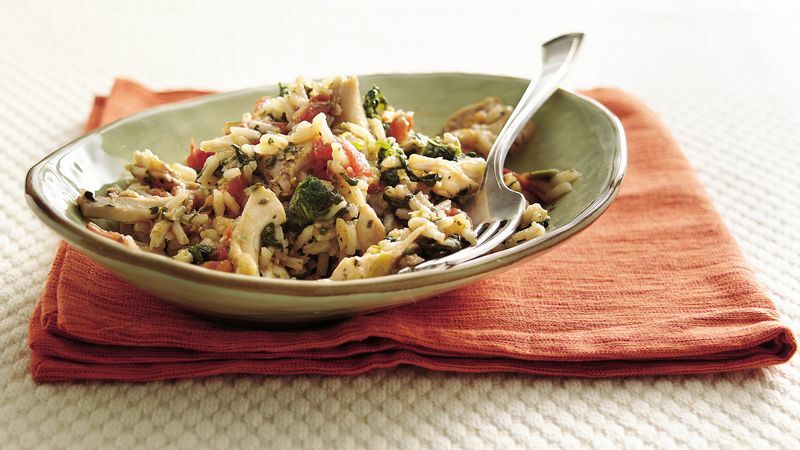 Stir in chicken and spinach. Cook uncovered 6 to 8 minutes longer or until thoroughly heated, stirring frequently to prevent sticking. Don't throw the dark green part of the green onions away. Chop it and store in a covered container in the refrigerator. Later, cook it in a small amount of butter and add to scrambled eggs or another recipe.